With step-by-step instructions and a VIDEO so you can make an easy, cheesy, Midwestern tater tot casserole, straight from the state of Minnesota! There’s bit of a nip in the air, my friends. It’s time to break out the jackets, scarves, fuzzy hats—and your favorite casserole dish. Let’s make a tater tot hotdish with Progresso Traditional Broccoli Cheese Soup! First, let’s clear up a common question. What’s the difference between a hotdish and a casserole? All hotdishes are casseroles, but not all casseroles are hotdishes. A casserole can be almost any combination of meat, starch, or vegetables in a binding sauce, like canned soup, tomato sauce, or cheese, cooked slowly in the oven in a casserole dish and served as a side dish or main course. What is a hotdish? A traditional Minnesota hotdish is a main dish casserole specifically made with canned soup, starch, ground beef, vegetable (often green beans), and sometimes shredded cheese, baked in a 13 by 9 inch pan or a large casserole dish. 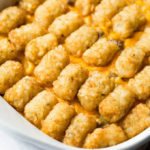 A tater tot hotdish uses tater tots as the starch element of the hotdish, along with ground beef, green beans, soup, and (usually) shredded cheddar cheese. 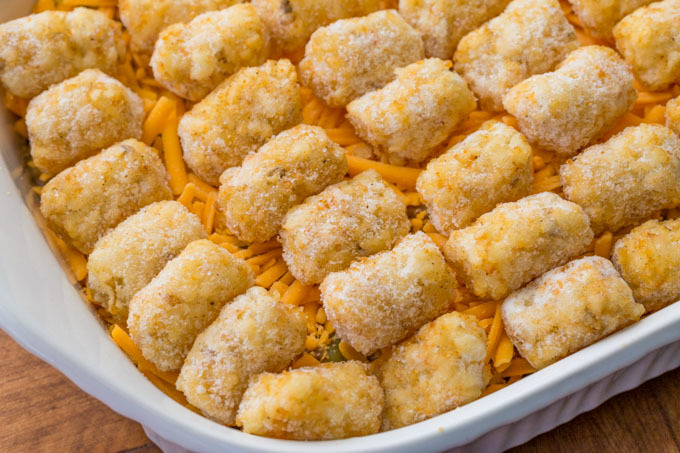 To make this tater tot hotdish, you simply cook some ground beef, mix in the Progresso Traditional Broccoli Cheese Soup and veggies, spread a layer in a large casserole dish or 13 by 9 baking pan, add a layer of shredded cheese, and top with tater tots. I like to use Progresso Traditional Broccoli Cheese Soup to make the very best tater tot hotdish. 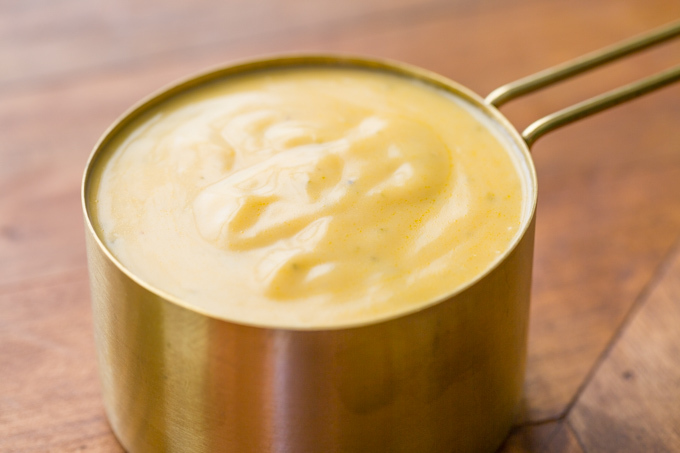 It adds rich, creamy homestyle flavor that brings everything together in savory harmony. 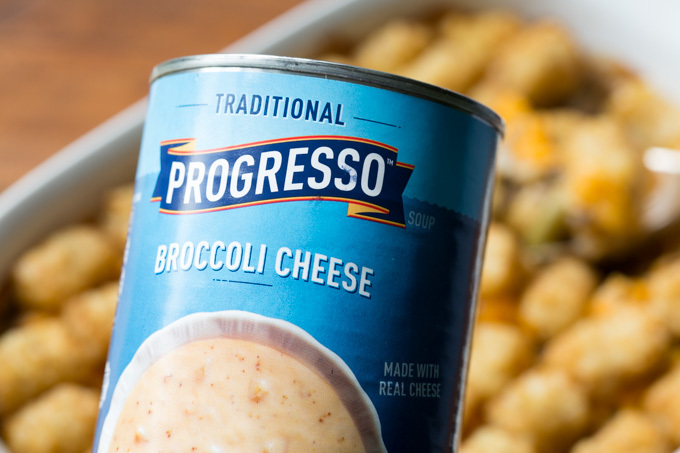 Progresso Traditional Broccoli Cheese Soup is ready to heat and eat, making it perfect for enjoying on its own or in a recipe like this tater tot hotdish. 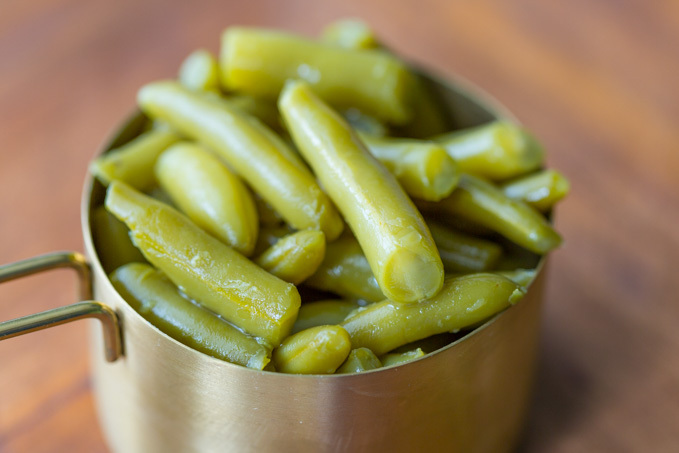 It’s versatile for all kinds of easy meals. This hotdish recipe is perfect for fall or winter, especially when you need a hearty plate of comfort food on a busy weeknight. What makes it even more appealing is that you can get all the ingredients, including Progresso Soup, from Walmart Online Grocery Pickup. 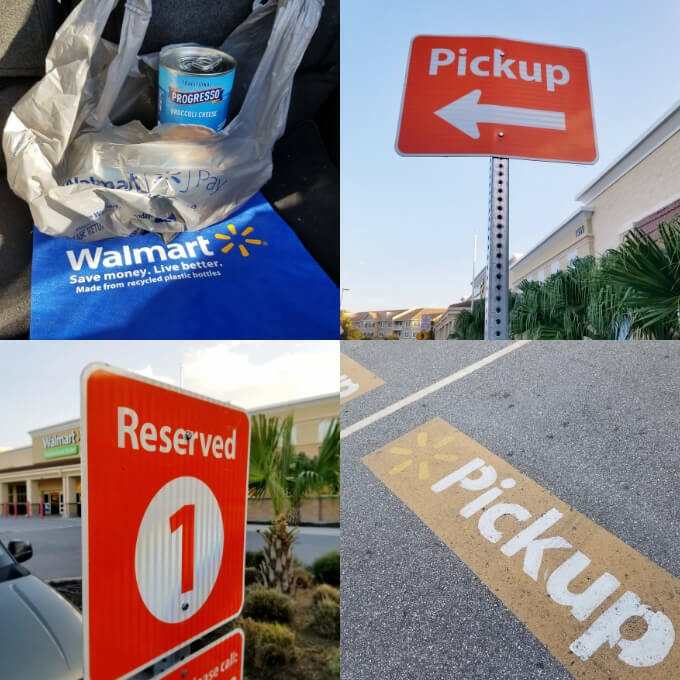 You can order everything via the Walmart website or app, reserve a pickup time, then pick up your order from the comfort of your own car the next day. That’s right: you don’t even have to get out of your car! I get an alert on my phone when my order’s ready. Then I check in when I’m on my way, which allows the Walmart Online Grocery Pickup team to get my order ready to bring out. When I arrive, they bring the groceries right to my car and load them into the trunk for me. Simple! 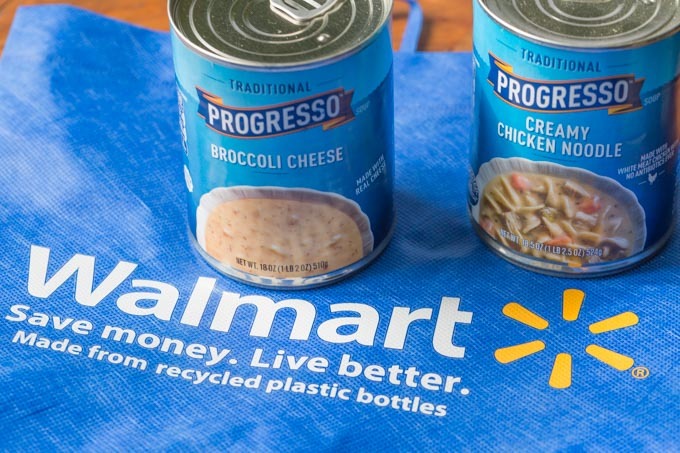 There are many Progresso Soups that work well for casseroles and hotdishes, so be sure to stock up on your favorite Progresso Soup varieties with Walmart Online Grocery Pickup! 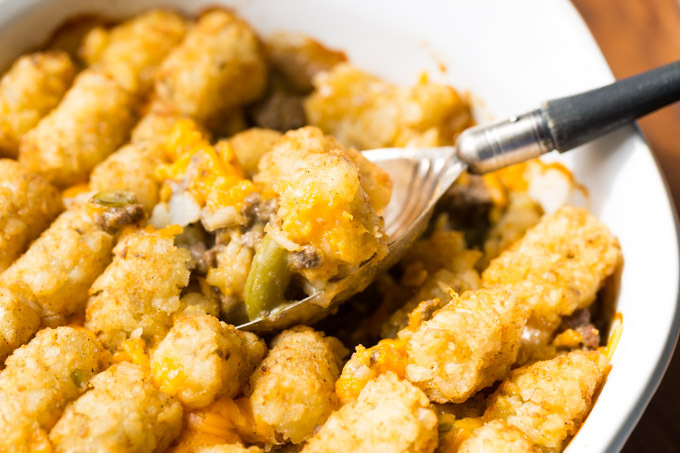 Tater tot hotdish recipe with step-by-step instructions and a VIDEO for making an easy, cheesy, Midwestern tater tot casserole from the state of Minnesota! 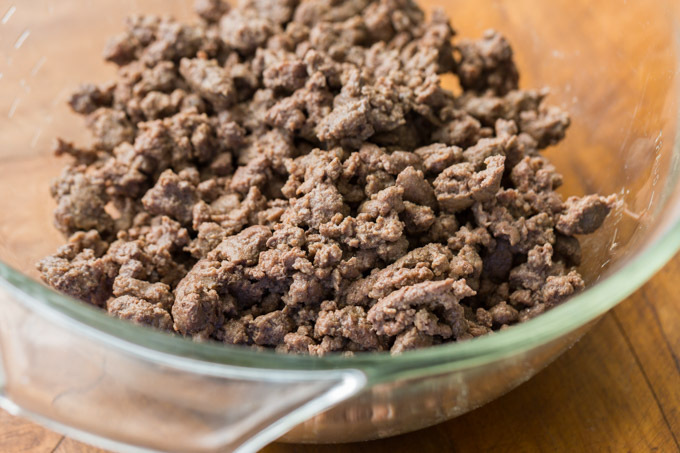 Preheat oven to 350 F. Cook the ground beef into crumbles in a large skillet over medium heat until done, about 10 minutes. Mix together the cooked ground beef, the drained green beans, and the Progresso Traditional Broccoli Cheese Soup. Spread the mixture into the bottom of a large casserole dish or baking pan. 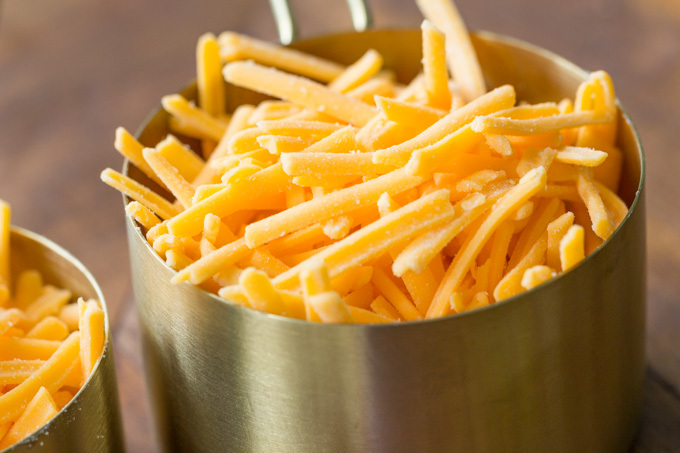 Sprinkle the shredded cheddar evenly over the mixture. 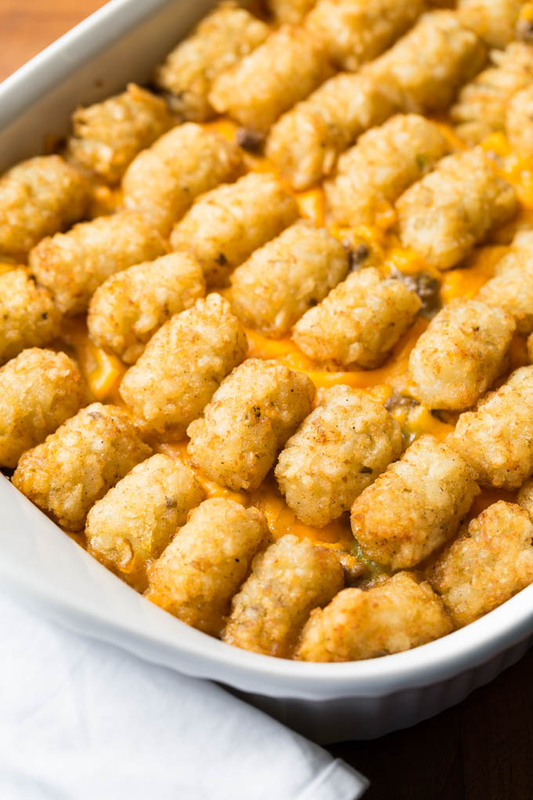 Arrange the tater tots in rows across the top of the cheese layer, leaving a little bit of space between tots so they can crisp up better. Bake for 1 hour and 15 minutes, or until the tater tots are crisp and the casserole is brown around the edges and bubbling all over. Let cool for 15 minutes before serving; slight cooling allows the tots to reach maximum crispiness. If you are gluten free, please be sure to double check all ingredients to ensure they are gluten free.